http://www.flickr.com/photos/suthlib/2553344790/, originally uploaded by Sutherland Shire Libraries. There was a very 'piratey' feel to the Library Week celebrations at Engadine Library. Our special Pirate themed storytimes for children were a big success with more than forty children attending. Children visitng the library were also encouraged to borrow a mystery book from our pirate ship display. Anyone brave enough to borrow a book from the pirate ship got a free pirate sticker. 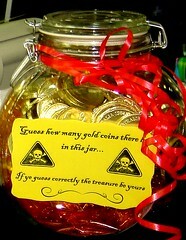 We also held a competition in which children had to guess the number of chocolate coins in a jar. The winning guess of 169 was only one coin off the exact number of 168. Happy eating to the winner! Our adult visitors weren't left out. We held a treasure hunt that involved people looking around the library for the answers to questions about the history of Engadine. We had two winners who each received a brand new book. Everyone who borrowed a book during the week entered the draw for a hamper of goodies, National Simultaneous Storytime was held on Wednesday and we also unveiled a pile of new books as part of What's Under Wraps. It was a busy week but it was great fun. Thank you to all who helped us celebrate Library Week at Engadine Library and we hope to see you back soon. Would You Pay for Library Services?